The 6th collection of new bloodlines for sorcerers clocks in at 14 pages, 1 page front cover, 1 page blank, 1.5 pages of SRD, leaving us with 10.5 pages of content, laid out in 6’’ by 9’’, so let’s take a look! -Bloodline Beast: Counts as Improved Familiar sans requiring the familiar class feature. There is no such feature. It’s witch’s familiar, arcane bond, etc. Level-restrictions thankfully still apply. A dead familiar causes Con-drain, but does not require costs to replace. Cool: Lets you bypass alignment restrictions. -Bloodline Bias: Choose a monster type from a list; you get +1 damage with damaging spells versus the chosen type and +1 DC. This also applies to sorcerers and bloodragers.A handy mini-table nets you the equivalents. -Sorcerous Battery: Use a limited use bloodline power to activate a magic item with charges as a standard action. CL of the item must be equal to or less than UMD ranks, and single use items can’t be activated thus. Nice one! -Sorcerous Power Drain: The inverse one: Drain magic items to power limited use bloodline powers. Caster level of the item must be higher or equal than your CL. This and battery could power a whole culture and are inspiring, though potent. -Sorcerous Synergy (Teamwork): +1 CL and +1 to DC and roll twice to bypass SR when aided asa full-round action by your buddy. The pdf also includes 7 bloodlines, the first of which would be aeon, which may never choose a good or evil spell to the list of spells known, but which allows you to combine Knowledge checks with spellcasting. This is a leitmotif of sorts herein: While I don’t always agree with the balancing, which sometimes makes the bloodlines clock in at rather strong levels, I applaud that they provide meaningful changes for the base spellcasting engine. Anyways, where was I? Oh yeah, aeon. We get a touch that dazes targets and also nets insight (Knowledge bonus) – nice limited use touch. Neat defensive tricks and a high-level combo-buff complement this one. The capstone makes you basically immortal…with auto-resurrection…but you do lose equipment…Cool one! The Demodand bloodline nets you a limited use Str-damage touch. Their higher-level slime-ability, oddly, works RAW versus ranged or reach weapons as well, which it should not. Cool: At higher levels, the bloodline lets you temporarily suppress divine casting and channel energy. The eclipse bloodline yields a positive or negative energy touch that can harm or heal, analogue to channel et. al. Dodge bonus, a wall of fire that can fascinate you, shadow step as a SP (plus immunity to [darkness] and [light] spells as well as an apotheosis of sorts complement this one. Also cool: The spells known make alignment-variations of spells more sensible for the sorcerer to take. Leshy-blooded sorcerers may add druid spells to their spells known, fire entangling pods, a “double-strength” (not exactly perfect rules-verbiage) shield with unique properties and more subdued abilities complement this one, making up for the potent spells-known expansion. The manasaputra bloodline nets you a third eye that opens on your head when casting spells, granting you a temporary skill buff. The bloodline also lets you fire limited fire or positive energy blasts, adaptive resistance and make a really powerful buffing aura at 9th level. The high-level abilities are slightly less potent to make up for that. The sakhil bloodline enhances the DC of fear-spells and gets a fear-inducing limited use gaze. Nitpick: Save DC should refer to class level, not just “level.” Ectoplasmic Spell sans casting-time increase (verbiage a bit wonky) and added ghost touch (not properly italicized) are okay, but the capstone immunity array is imho a bit overkill. Finally, the yaksha bloodline nets you spell level as a bonus to Fort-saves for 1 round after casting. The touch attack labors under the misconception that “distracted” is a condition – it’s not. Worse: It generates a gold coin. Sure, only 3 + Cha-mod per day, but you can wreck an economy with a bunch of these sorcerers. The bloodline also includes a fertility field, metamagic and an interesting apotheosis. The pdf comes with a bonus-file depicting the Children of the Dead, a monster penned by Mark Gedak and Perry Fehr. These are undead that are spawned by the dread crypt mothers – they have the dhampir subtype and are slavishly devoted to their horrid progenitor. The pdf includes three variants. Really cool, if grim CR 1 critter with a neat full-color artwork. Editing and formatting oscillate a bit: I did notice a few formal glitches and rules-verbiage deviations, but also a couple of complex concepts well executed. The pdf actually manages to be innovative and interesting more than once, which does help mitigate some of the issues I encountered. Layout adheres to Purple Duck Games’ 1-column standard with purple highlights. The pdf comes fully bookmarked for your convenience. 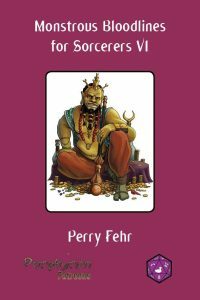 Perry Fehr knows how to write intriguing, creative crunch, and when he makes sure his rules-fu is top-notch, we get amazing stuff. There are a couple of real gems herein, but also quite a few hiccups and potential issues. This is not a pdf that will fit every campaign, but it is one that may well be truly inspiring for some. Ultimately, this is pretty much the definition of a mixed bag, which lies slightly on the positive side due to its neat ideas (=3.5 stars). Now, usually, I’d still round down here, since a few of the hiccups are pretty grievous, but the neat bonus critter and low and fair price point make me round up instead. You can directly support Purple Duck Games keeping the PF1-flame alive here on patreon! I think you forgot to actually put a rating on this one!